Today was the first time I had ever really explored the secret stairs in Sausalito. This visit was long overdue. In January, I was meandering around Bridgepoint Way with friends and family, and I spotted Excelsior Lane. But aside from that, I never had taken the time to really explore. Today was the perfect day. The weather was fantastic and the sky was crystal clear. 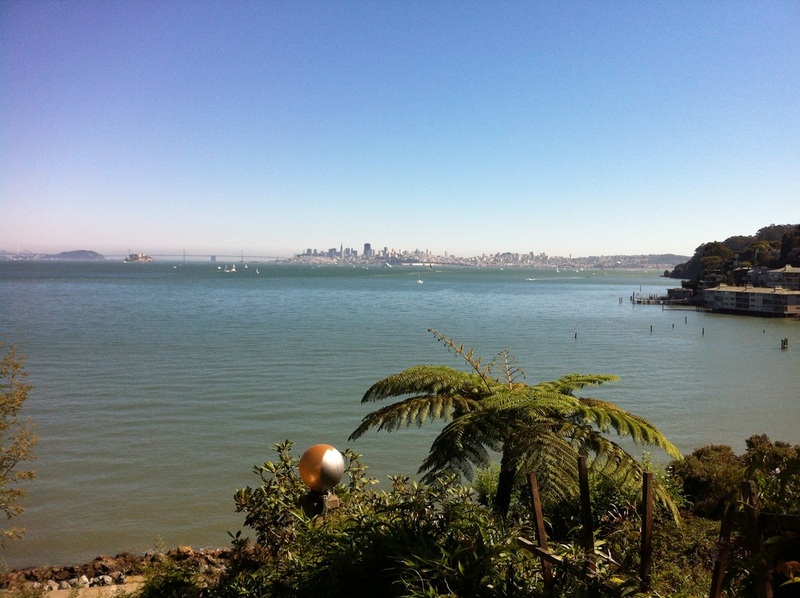 The views of Sausalito definitely represent San Francisco in a positive way. I'm not sure that any stairway in the East Bay has better or closer views of San Francisco. I started off on somewhere in the middle of Bridge Way St. The shops were fantastic, Sausalito has many charming restaurants. I have to admit that for a minute I felt like skipping the stairs and just hanging out on Bridge Way. But I knew that I had to complete my objective. The first stairway I found is called the El Monte Lane. (Video Below) El Monte Ln contains somewhere around 125 steps and as shown in the photos below, there are 3 different sections, upper, middle, and lower. Upon ascending these steps, I turned right on Bulkley Ave. I did find an enormous white mansion, but couldn't really spot any secret stairs. So I headed south towards Bridgepoint Way. The 2nd stairway is called Reade Lane. This is an alley off of Bridgepoint. I almost skipped it since it appeared as if it was just 10 or 12 steps led to the middle of nowhere. I chose to explore it anyways. An amazing surplus of 40 steps sits just left and past the alley. I was pleasantly surprised and realized that that's what stairway/ urban exploring is all about! The 3rd stairway is the Excelsior Lane, also off of Bridgepoint. (Video below) It's a medium stairway in terms of length, but it's a neat scene, and probably one of the more known sports in Sausalito. Great view, you can enjoy gazing at the bay, the water fountain, the downtown, the sail boats, and the clear sky. The 4th stairway is called the ''North Street Steps.'' This is probably one of my favorite stairways of the whole bay area. 121 steps in all, this stairway is right next to Tiffany Park, there is also a plaque at the base of the steps which reads; ''Little Mother of Old Town''. I also loved the lighted pillar. But the views of San Francisco, the bay Bridge, and Alcatraz are astonishing. When I reached the top of the stops I decided to stare at the view for about 10 minutes. Admittedly, I had no water to drink. I was thirsty and a very nice lady actually offered me a water bottle. I walked left on Richardson St after ascending to the top of the ''North Street'' Steps, and about a hundred feet away found the 2nd street steps. These are 46 steps along a sidewalk. I paid a visit to the Mill Valley Community Center. Paid $5 to get a map on most of the stairways Mill Valley. This guide details the 175 heritage steps, lanes and paths. Without the help of a book such as the San Francisco Stairway Walks and East Bay Secret Stairs, I'm going to have to be creative with the map and create my own routes, and I'm up for the challenge. 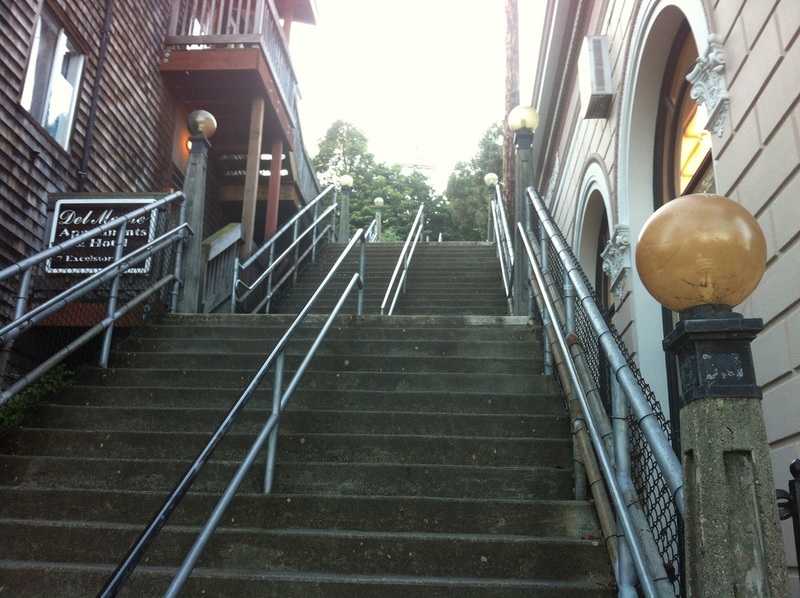 My goal is to eventually explore all 175 steps and lanes in Mill Valley and to also explore the 24 in Sausolito. Corte Madera is known to have some steps, and Belvedere possibly has some. My first stairway was a revisit to the famous Dipsea Steps. Dipsea is known to be one of the biggest races in the world, annually, and it starts off on the well known 678 steps. 3 segments. I did the first two today. Started off on Cascade Way and behind Old Mill Mark, ascended up 313 steps. Turned right on Millside Lane. Marion Ave spits in two. Took left side. The second part of Dipsea is known as Ocean Way. 223 stairs. I climbed down all the way to the bottom of the first stairway. Turned left on Cascade and meandered for a bit. Turned left on Waynewright and up the steep hill. Before the road turns right, I spotted the McGlashen Ln Stairway. Now this stairway is very intriguing. It's wooden, embellished in the forest, very long, and it zig zags. 168 total stairs. Climbed up. I would say this stairway reminds me of the stairway in Turtle Hill, San Francisco. The stairway I'm talking about is the spiral stair that ascends up to Grand Park. Pics 1 and 2. This map details 175 steps, lanes, and paths in the city of Mill Valley. Was with long time friends today and we had lunch in Sausalito. When walking near the quirky souvenir shops by the bay, I spotted a few stairways. I don't think they saw the value in it because it was just some pathway that they didn't know where it led to. Nevertheless, I spotted the stairway on Excelsior Lane and instantly identified the lane as a stairway similar to those of San Francisco, Berkeley, or Oakland. This has inspired me to do some more stairway searching in Sausalito as I am sure there are some more stairways. Today was my first trip to the Marin County Stairways. 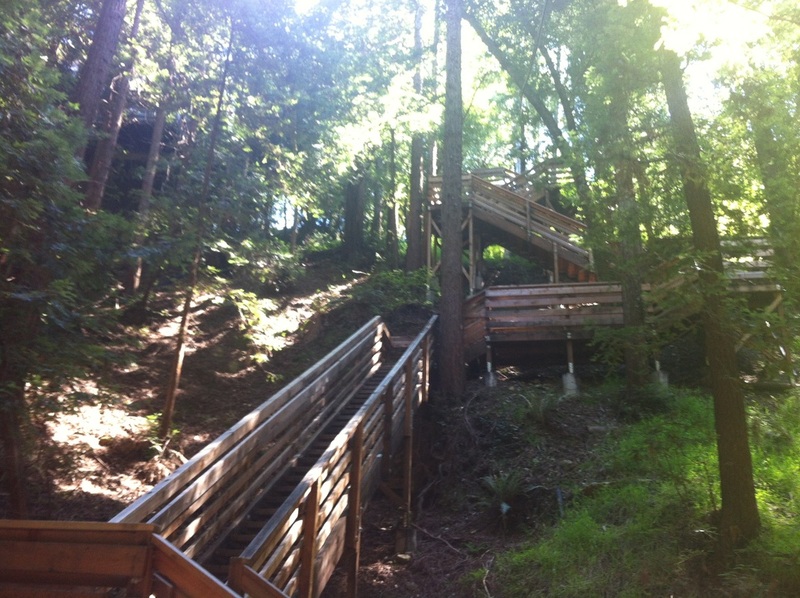 I chose to check out the famous Dispea Stairs in Mill Valley. 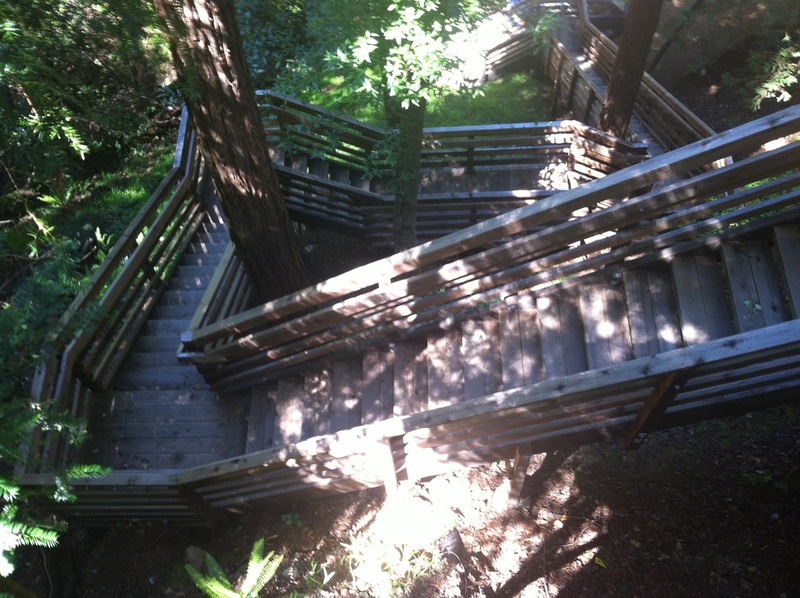 These stairs lead up to the Dipsea Trail. I was very impressed by the whole area. The trees were enormous and there were hardly any cars. There was a lot of friendly neighbors and walkers who helped guide me to get to the Dipsea Steps. It starts on Cascade Dr. I had went up about 10 minutes too far and finally found it by a park. Actually, the Dispea Stairs were located just in front of the park and up a small trail by a private driveway. The stairway was a total of 680 steps, possibly the most in the bay area for any single stairway. It consisted of 3 different sections. The first was the lower part by Cascade Dr. Cascade had 313 stairs by itself. It had plaques on each of the steps towards the beginning. Donors had donated over a grand to have their names printed on them. After, there were about 200 or so wooden steps, and then about a final 30 or so rock steps. Next, I headed right about half a block uphill to Ocean Way. The stairway continued up another 223 stairs. I had to make a stop about halfway up, as it was a heck of a climb. I appreciated the trees. Once I got to the top of the stairs, I headed left for about 100 feet and the stairway continued on Hale Lane, which was another 150 stairs. Anything over 100 is a climb, but that seemed small compared to the ones I had already ascended up to. I got to the top and took a picture of a hilly Marin view. Everyone in that town seems to know the Dipsea Stairs. It was a very impressive trip. Bottom of Lower Dipsea Stairs, 313 total.